OLD PARKED CARS. 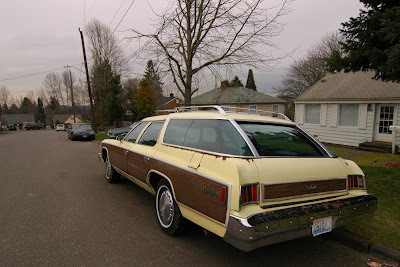 : 1976 Chevrolet Caprice Estate Wagon. tremendous car, tremendous opc. so much more style than expected for the malaise era. that wrap-around rear glass is unlike anything i've EVER seen. and the acres of uninterrupted woodgrain. the front clip instantly calls to mind this other piece of "Real American Iron", per "Fordman1." Outstanding find. Those tires look enormous and cartoonish. I don't recall these cars having such enormous tires back in the day. Those Large Chevy/Buick/Olds wagons of that body style have the neatest rear tailgate/window combo. Called the "clamshell" tailgate, the rear glass retracts into the roof and the rear tailgate slides underneath the car electronically. 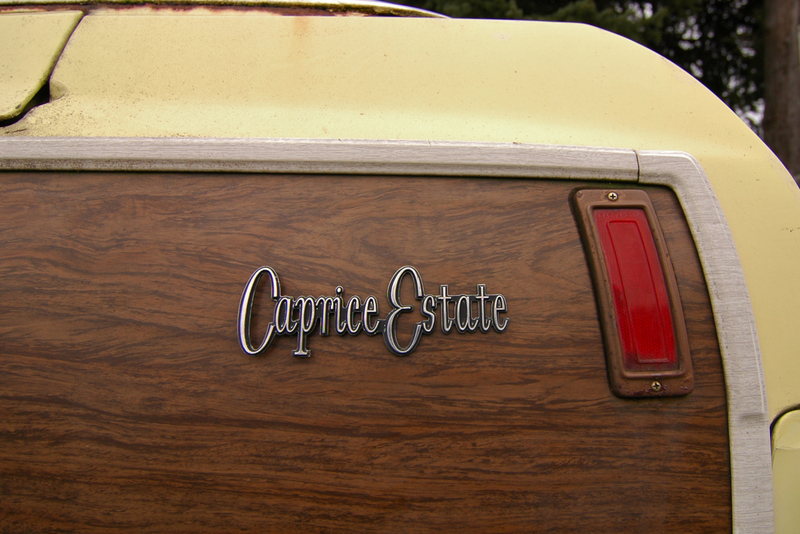 Mmmmm...malaise era Caprice estates....Definitely agree with Anon. Donk that ride. Looks like its halfway there already. Wow ! It's been a long time. Almost 2 weeks i haven't been on OPC. 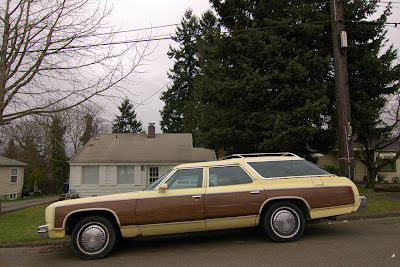 When I get back on this site I see fine 1970's cars and I almost missed it. Greetings from Grenoble for 2014. I was raised in a car very similar to that. It was the same exact color the only difference that it was two years older. 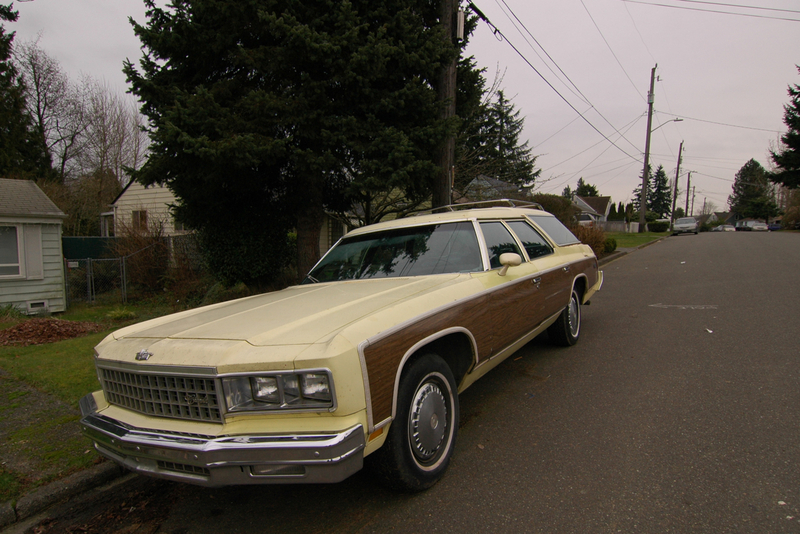 My parents brought a brand-new 1974 (9–8 passenger) Chevrolet Caprice estate wagon with woodgrain as well. They went back into their old neighborhood in the Bronx and bought the car. That rust on the car totally reminds me of the station wagon we had. I asked my father when the car started rusting & I was told it started happening when the car was either two or three years old. I remember the last time I saw that car, it was in the fall of 1985. The 74 Caprice was sharp, when you put the hazard lights on the front grill lights blinked on, & the side lights went off then the side lights went on and the front grill lights went off. I actually blew the horn into a radio/tape recorder before we got rid of it. The horn was a very loud baritone type of horn. It must've had dual horns. I remember either in 1980 or 81 my family & another family took a ride to Six Flags Great Adventure in New Jersey in that car. Those clam shell tailgates were fun opening in the rain or with a layer of snow/ice.